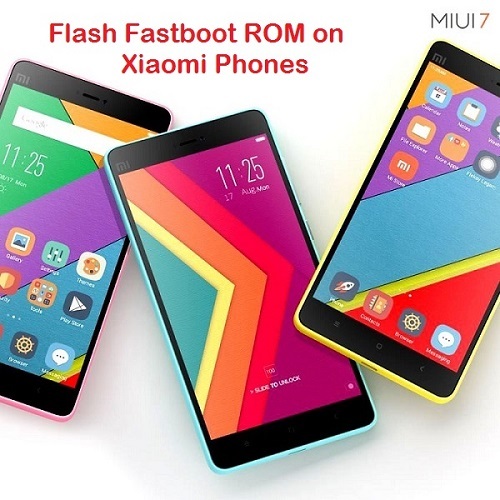 Earlier we have showed you the best 3 ways to update your Xiaomi phones to latest MIUI 7 ROM and now we are back with another tutorial on how to flash Fastboot ROM on Mi phones using Mi flash tool. To flash fastboot ROM on your smartphones, you need to have Mi Flash tool, fastboot ROM of your device model and a PC. Before proceed with the process, let have a detailed info about Fastboot ROM. Fastboot ROM is entirely different to that of Recovery ROM where you need to connect the device with PC and a Mi flashing tool is used. Here the user has the option to select whether to wipe data or not. The Fastboot ROM is mainly flashed whenever you facing any bugs/issues, bricked phones, etc. All the Xiaomi smartphones namely Xiaomi Mi 4, Mi 4i, Mi 3, Mi4c, Redmi Note 2, Mi Note, Redmi 1S, Redmi Note 3G/4G, Redmi 2/Prime, and Mi 5 are compatible with the below fastboot flashing process. It is advisable to perform a total backup of all your important data and charge your device well enough to complete the flashing process. You can use third party Android apps to take backup of contacts, call logs, messages, and other files. Disclaimer: Xiaomi Advices and Xiaomi is not responsible for any damage occurs to your handset in case the below steps are not followed correctly. 1. Download Fastboot ROM from the above link to your PC and extract it to desktop. 2. Now you need to download and install Mi Flash tool on your PC. 3. Next Run Mi Flash application and tap on ‘Browse’. 4. Next you need to select the ROM folder from desktop. 5. Turn off the device and enter into Fastboot mode. You need to press Volume Down + Power button at the same time to boot your device into fastboot mode. 6. Connect your device with PC. 7. Next go to flashing tool and tap on ‘Refresh’ button to see the connected devices. 8. Once the device is detected, you have three options to choose as per your requirement as show in the above image. Flash_all_except_storaget:- Will erase all user data does not clear the built-in storage data. 9. Tap on ‘Flash’ at the top right to start the flashing process. 10. Once done with the flashing process, the device will reboot automatically. Note: As it is the first reboot after flashing ROM, it might take up to 5-10 minutes. So, hold your seats and wait. So, it was the process to flash Fastboot ROM on any Xiaomi Android Smartphone using Mi Flash Tool. If you face any problem while flashing Fastboot ROM, do leave a comment below as we are always there to help you out. If the above tutorial really helped you, do share with your friends via Facebook as they might find it useful. Subscribe for more Xiaomi Android phones tips and tricks.